Somewhere in a suburban office park hides a secret stash of Daimler DS420 limousines, restored to perfection. It's perhaps the largest stash of running Daimler limos anywhere in the world. Amongst this Daimler collection is a 1975 Daimler Hearse built by Thomas Startin Junior Limited. Here's the kicker. It's going to be used as a Halloween display to lure in unsuspecting adults and children. The diorama took more than three months and an entire army of the dead to create! What better way to display a Halloween diorama, but to put it in the back of a rolling hearse? One of these DS420s is the only U.S. model ever produced. Guess who owned it? None other than our very own Mrs. Wal-Mart herself. With less than 30,000 miles on it too to boot! 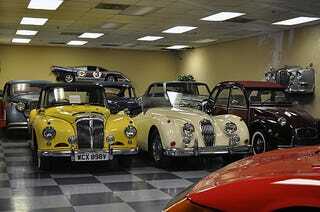 Each of these Daimler DS420 beauties has a story behind it. I would like to go through each of them with you, but with over ten of them, I'll have to hold back for now. I can tell you that each has a powerful 4.2L, dual cam, six cylinder engine and four wheel independent suspension. They are smooth criminals for sure. There's so much more in this collection that I couldn't possibly fit it all into a single article. I'm not kidding. There's a tank in this building. No, not a water tank. A military armored tank. You'd think that would be enough for a WIN, right? Wrong, my friend. In the back of this private museum is THE rusted-out RV from the 1989 movie, National Lampoon's Christmas Vacation. You'd think it looks this way because it's an old neglected RV, right? Wrong again, buddy. This RV is in the process of being restored to look like it did in the movie, complete with Snot's dog prints on the door! How is that for detail? You said it, guy!